The new Belfast City Council comprises of the entire original authority, plus 20% of Lisburn, 40% of Castlereagh, and the very small Cedar Grove area from North Down. The expanded Belfast now has 27 Nationalists, 24 Unionists, and 9 other councillors (8 Alliance and 1 Green) holding the balance of power. The elections delivered much the same result as I had projected for the previous poll in 2011, with gains for the UUP and the smaller parties - with some very tight squeaks. Includes these wards: Belmont, Garnerville, Gilnahirk, Knock, Sandown, Shandon, and Stormont. Electorate: 20,881; total poll: 13,192 (63.1%); invalid votes 118 (0.9%); valid votes: 13,074; quota 1,635. Vitty (DUP) finished 172.45 votes behind Brown (Green), with a UUP surplus of 4.76 undistributed. A perfect balance between the top three Alliance candidates could have seen them keep the Greens out, but on the 10th count McMullan was 56.7 votes behind Brown, with both Jones and McNamee 300 or so ahead. There isn't usually much need to comment on the numbers below the box, but the high turnout and low rate of spoiled votes here are both pretty remarkable. Irish Observer and Faha both projected 3 DUP, 3 Alliance, 1 UUP, so this can be counted as UUP and Green notional gains from the two larger parties. Includes these wards: Ballymacarrett, Beersbridge, Bloomfield, Connswater, Sydenham, and Woodstock. Electorate: 21,425; total poll: 10,082 (47.1%); invalid votes 182 (1.8%); valid votes: 9,900; quota 1,415. Hendron (Alliance) finished 101.82 behind Armitage (also Alliance), with a PUP surplus of 39 and DUP surpluses totalling 16 left undistributed. Irish Observer projected 2 DUP, 2 Alliance, 1 UUP, 1 PUP, and Faha projected 3 DUP, 2 Alliance, 1 PUP, so this can be counted a notional SF gain from Alliance and possibly a UUP gain from the DUP. Includes these wards: Cregagh, Hillfoot, Merok, Orangefield, Ravenhill, and Rosetta. Electorate: 20,089;total poll: 10,656 (53.0%); invalid votes 159 (1.5%); valid votes: 10,497; quota 1,500. Hussey (DUP) finished 202.01 votes behind Sandford (also DUP), with an undistributed Alliance surplus (originating from SF!) of 47.5. Irish Observer and Faha both projected 2 DUP, 2 Alliance, 1 UUP, 1 SDLP, whch was the actual result. Includes these wards: Ballygomartin, Clonard, Falls, Forth River, Shankill, and Woodvale..
Electorate: 20,881; total poll: 11,809 (56.6%); invalid votes 304 (2.6%); valid votes 11,505; quota 1,644. The published results sheet shows Manwaring (UUP) as only 17.36 votes behind Bunting (TUV) on the final count, with an SF surplus of 88 (transferred to McConville from the SDLP's Keenan) undistributed. Granted, it is unlikely that these transfers would have helped Manwaring - most of them would have been aborbed by McVeigh (SF), who was still 97 votes short of the quota. But it is an odd incompleteness in the record. Better balancing from the DUP would certainly have given them a good chance of winning all three Unionist seats. Irish Observer and Faha both projected 3 DUP plus 1 Ind (McCoubrey, who had meantime joined the DUP), 2 SF. This could therefore be seen as TUV and PUP gains from the DUP, taking into account McCoubrey's change of allegiance. 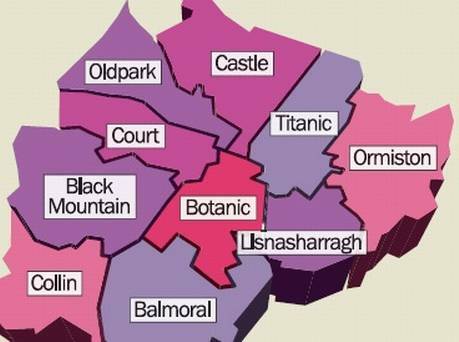 Includes these wards: Blackstaff, Central, Ormeau, Stranmillis, and Windsor. Electorate: 19,462; total poll: 9,186 (47.2%); invalid votes 192 (2.1%); valid votes 8,994; quota 1,500. Bailey (Green) finished 126.80 votes behind Craig (UUP). There were just over two Unionist quotas at the outset, and TUV transfers pulled Craig decisively ahead. Irish Observer and Faha both projected 1 SDLP, 1 Alliance, 1 SF, 1 DUP, 1 UUP, which was the actual result. Includes these wards: Bellevue, Cavehill, Chichester Park, Duncairn, Fortwilliam, and Innisfayle. Electorate: 20,977; total poll: 10,573 (51.3%); invalid votes 175 (1.6%); valid votes 10,578; quota 1,512. Cunningham (SF) finished 112.63 votes behind Browne (UUP), himself only 5 behind Patterson (DUP), with an Alliance surplus of 37 undistributed. The DUP balance was very impressive, the initial 63-vote margin between their candidates narrowing to 27 at the end, and better balancing by SF probably would not have made a difference; in the end the votes and transfers weren't there. Irish Observer and Faha both projected 2 DUP, 2 SF, 1 SDLP, 1 UUP, so this can be counted a notional Alliance gain from SF. Includes these wards: Belvoir, Finaghy, Malone, Musgrave, and Upper Malone. Electorate: 17,107; total poll: 9,032 (52.8%); invalid votes 131 (1.5%); valid votes 8,901; quota 1,484. Clarke (DUP) was 101.3 votes behind Dudgeon (UUP) on the last count, with Stalford (also DUP) 64.96 ahead of her - so a perfect DUP balance would not have been enough to win two seats. Irish Observer and Faha both projected 1 SDLP, 1 DUP, 1 Alliance, 1 SF, 1 UUP, which was the actual result. Includes these wards: Ardoyne, Ballysillan, Cliftonville, Legoniel, New Lodge, and Water Works. Electorate: 20,888; total poll: 10,793 (51.7%); invalid votes 258 (2.4%); valid votes 10,535; quota 1,506. Fennell (Ind) finished 161.14 votes behind Mallon (SDLP), with an SF surplus of 121 undistributed which might have narrowed the margin. Corr's winning a seat from barely half a quota of first preferences looks impressive at first sight, but in fact there were 2.2 Unionist quotas, and given the DUP's poor balancing the second seat was always likely to go to the strongest placed of the rest; Corr's ten-vote margin over Reynolds (DUP) on the first count was also boosted by TUV and UUP transfers. Better balancing between the SF candidates could have kept all four ahead of Fennell (Ind), and they might then have benefited from his transfers sufficiently to out-distance Mallon (SDLP) for the fourth Nationaliost seat - but it would have been very tight at the end. Irish Observer and Faha both projected 3 SF, 2 DUP, 1 SDLP, so this can probably be counted as a notional PUP gain from the DUP. Includes these wards: Dunmurry, Ladybrook, Lagmore, Poleglass, Stewartstown, and Twinbrook. Electorate: 20,017; total poll: 11,360 (51.6%); invalid votes 202 (1.8%); valid votes 11,158; quota 1,512. Burke (NI21) was a pretty massive 620.87 votes behind Groves (SF) on the final count, with an SDLP surplus of 29 and SF surpluses totalling 177 undistributed. She had done well to suvive that far, outlasting three other candidates who had gained more first preferences - Alliance transfers pulled her ahead of the UUP, and UUP transfers then put her ahead of both Éirígí and the SDLP's second runner. Irish Observer and Faha both projected 5 SF, 1 SDLP, which was the actual result. Includes these wards: Andersonstown, Ballymurphy, Beechmount, Collin Glen, Falls Park, Shaw's Road, and Turf Lodge. Electorate: 25,146; total poll: 14,311 (56.9%); invalid votes 369 (2.6%); valid votes 13,492; quota 1,743. Mhic Giolla Mhin (SF) was only 8.43 votes behind Beattie (SF) on the final count, but was 104 behind Attwood (SDLP). A perfect balance between all six SF candidates could in theory have kept Attwood out, but it would have required an implausible level of finesse. Irish Observer projected 6 SF, 1 SDLP, and Faha projected 5 SF, 1 SDLP, 1 Éirígí, so it can be debated who PBP made their gain from.